Civil engineer Urban Nordh, who took 10 months of leave, said he and his wife “worked really hard” on potty training. 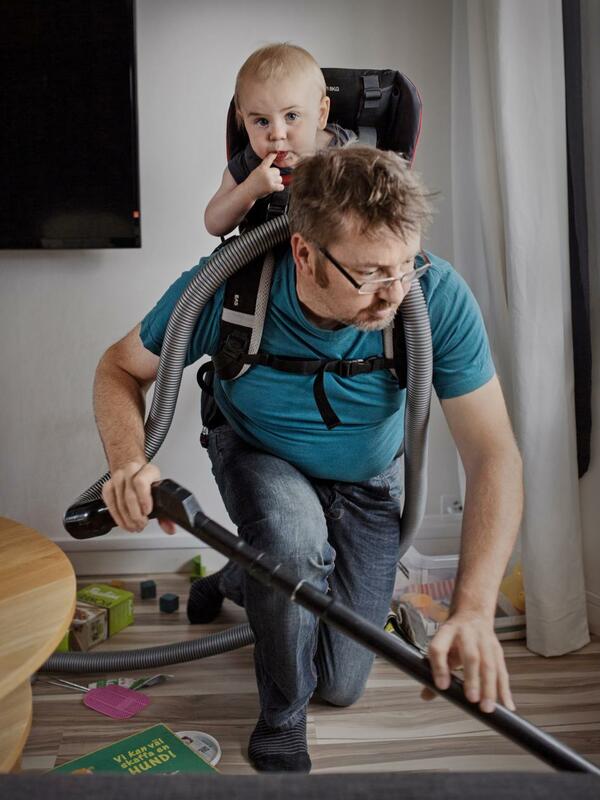 During his eight months on leave with his son, Gustav, buyer Ola Larsson resorted to multitasking to keep the toddler out of the way of the vacuum cleaner. 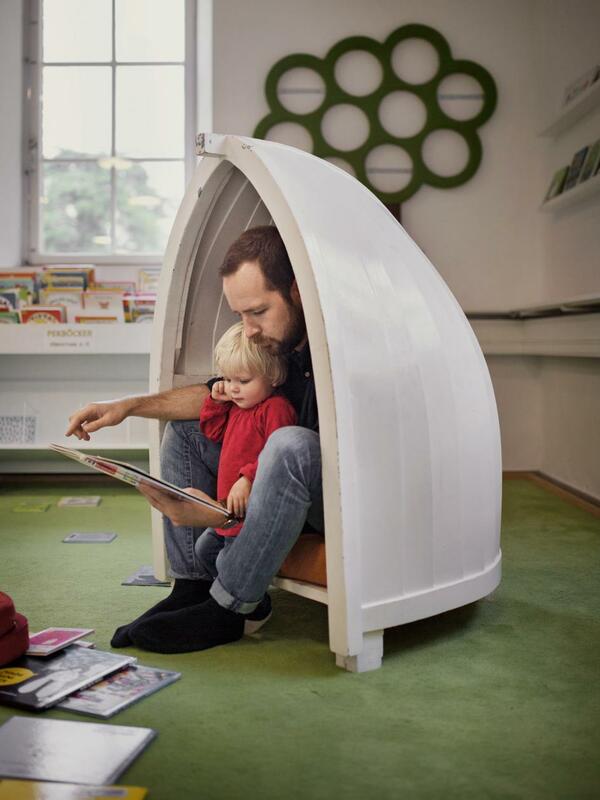 Erik Lindblad, a medical doctor who shared parental leave time equally with his wife, reads at the library with daughter Märta. After twins Parisa and Leia were born prematurely, their father, Samad Kohigoltapeh, spent some 10 months on parental leave with them. Martin Gagner’s family moved from the Netherlands to Sweden to get more leave time with son Valdemar and daughter Mathilda, whose fingernails he’s painting. Sweden’s leave system “seems like a utopia for many people,” says warehouse worker and musician Markus Bergqvist, who took six months off with older son Ted and eight months off with younger son Sigge. “I’m eternally grateful for having been on leave for such a long time,” says student Juan ardenal, who was at home for nine months each with Alma (left) and Ivo. 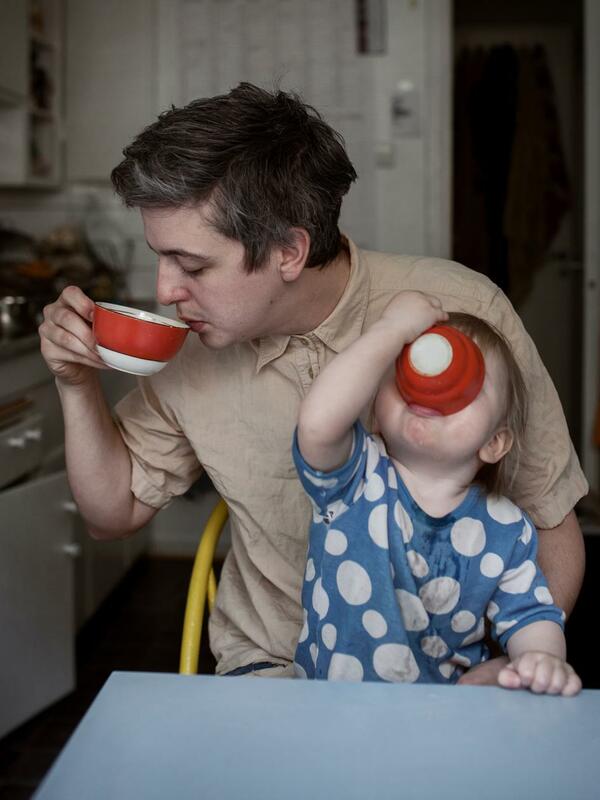 Johan Ekengård and his wife equally split the allowed parental leave. 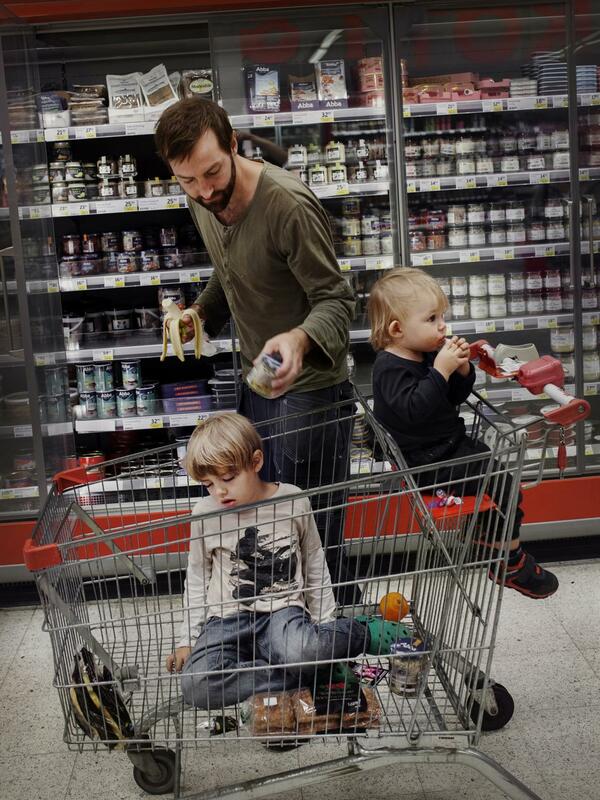 Here, he manages the morning routine with their children, from left, Tyra, Stina, and Ebbe. “I think I’ve learned a lot about myself during my time at home with Elling,” says artist Loui Kuhlau, who took a year’s leave to be with his son. “Our children trust in me as much as in my partner,” because both have taken leave, says probation officer Andreas Bergström. It’s bath time for Sam (in sink) and Elliot. Teacher Fredrik Karlsson cuddles his daughter Harriet. He took a year of parental leave with her, as he did with her sister, Edith, who’s behind him. 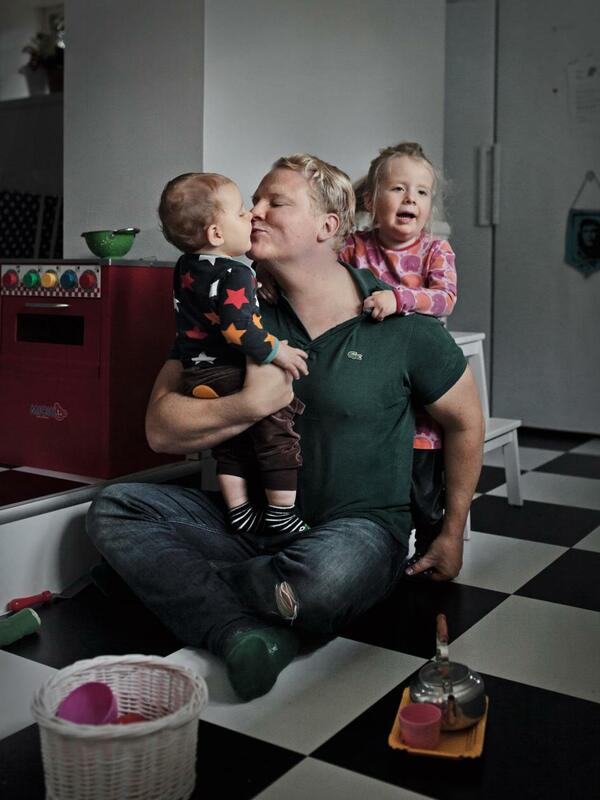 A father and photographer captured the lives of men like him, who split parental leave duties with their wives under Sweden’s generous policy. When Johan Bävman’s son Viggo was born, so was a deeply personal photography project: a look at fathers using Sweden’s expansive parental-leave policy to stay home with their children. Paid maternal leave around childbirth is commonplace throughout the world: It’s federal policy in 34 of the 35 member nations of the Organisation for Economic Co-operation and Development (all but the United States). About two-thirds of those nations also fund at least brief parental leaves for fathers—a benefit first extended by Sweden, in 1974. Sweden’s program has allowed parents to split 480 days of subsidized leave to care for children and earn bonuses according to how evenly they split the leave. 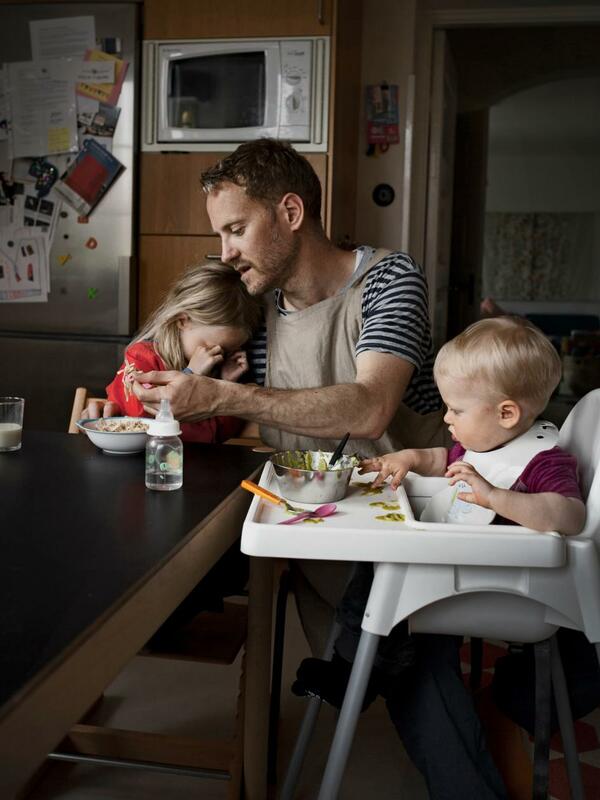 But despite those incentives, only about 14 percent of Sweden’s fathers “share the days equally with their partner,” Bävman says. Like most new mothers, Caroline Ihlström looked forward to cuddling and feeding her newborns. But premature twins Parisa and Leia were unable to nurse. 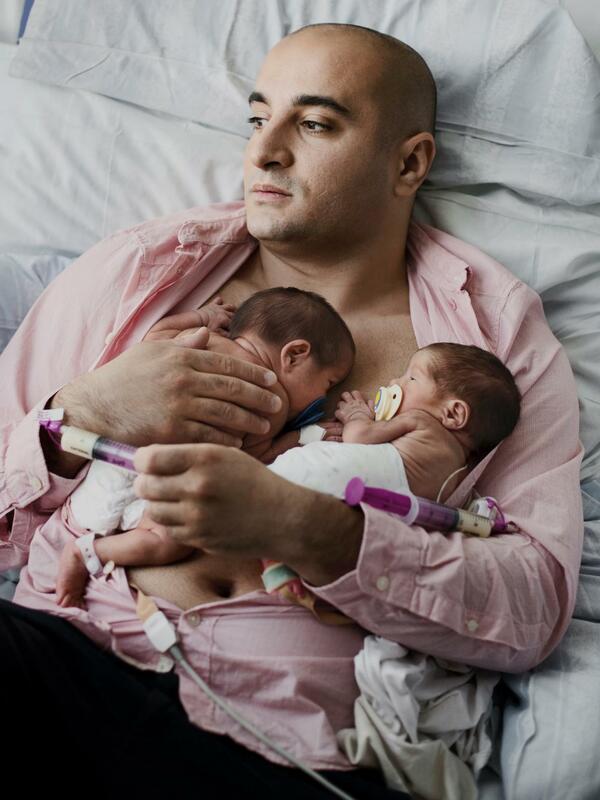 When Bävman arrived to take photos shortly after the twins’ birth, their father, Samad Kohigoltapeh, had fed them formula by syringe and was warming them against his skin. A construction engineer, Kohigoltapeh took joint parental leave with Ihlström for the babies’ first four months—and then soloed with them for six more months. Taking long leaves with his children has made him a better parent, Bävman says. He hopes his photography project will inspire more fathers—and more countries—to give the idea a try. This article and photo gallery originally appeared on nationalgeographic.com in January 2017.